In France there are book shops. In England a few still cling on but they are hard to find. Whilst the French have embraced much of the out of town retail centre/shopping mall culture, the book trade is still in independent hands. The sale of books online lags far behind the UK and The USA. A few Parisian sophistogauls possess Kindles but I suspect even they read e books about propagating chic organic cucumbers in their attics. Eventually I plucked up courage to enter my local “librairie”. After all, I am Anglaise and so are my books. I imagined they would not be impressed by some Femme Franglaise swaggering in to anounce myself as the only International Number One Best Seller of female fantasm in the village. So – I took in some respectable material – my series of children’s books and of course some serious poetry which I publish at Gallo-Romano media. I met a wonderful French lady. “No one buys poetry or children’s books,” she said, selecting instead the crime soaked oversexed romance which is my more worldly genre. “There are many English in the region – this is the stuff they like,” she assured me. Obviously she knows what appeals to the daring fantasy follicles of the Anglo Saxon lady. The bookshop “Le Passage des Heures” is a little marvel. Books on The Forgotten Vegetables of France lounge casually on the shoulder of Emile Zola. The place is adorable for a book groupie like me. We talked about the price of my books. I mentioned Amazon. A Gallic eyebrow shot out the roof of the building. Seemingly, the affairs of Amazon are of no interest. “We resist!” said the lady. Indeed they do. France is still a very foreign country – no matter where you are from. Being French is a talent and I will never be equal to it. Generally they understand how awful it is to be foreign and are very kind. 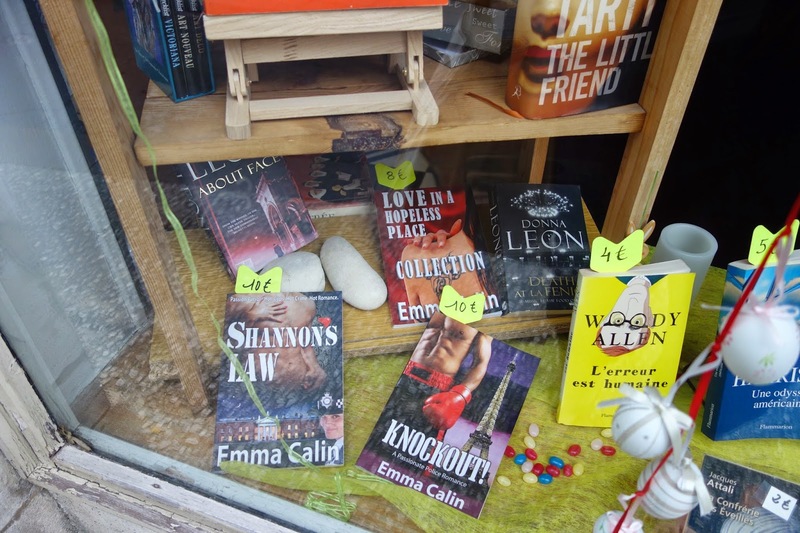 As a result there is a bookshop in Saint Savinien with my books in the window. Merci beaucoup. Eat your heart out Waterstone’s. Emma Thinx: Foreign – a land of fear, spice and possibility. 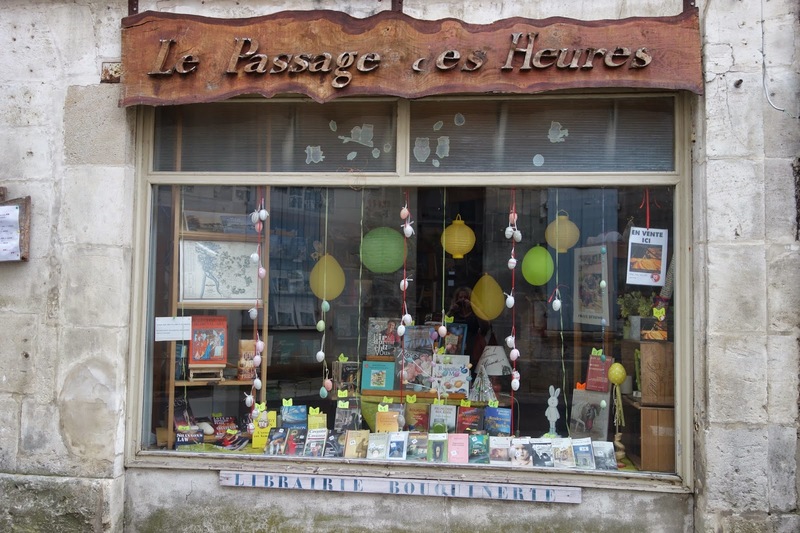 This entry was posted in book shops, Charente-Maritime, French Resistenace, Le Passage des Heures, Saint Savinien Sur Charente by emmacalin. Bookmark the permalink. Very cool. And, I have to say I'm envious. I loved France the few times I was able to visit – once for a whole month! Very cool, indeed. Like Darlene, I'm envious, too.